California state law prevents cities from denying housing proposals that comply with objective zoning standards, general plans and environmental laws. In practice, cities often deny housing proposals anyways because there is no statewide enforcement agency. New housing production inevitably plays a role in the lives of California renters. Denial of housing proposals means fewer options available to renters as our population grows and our rental stock ages; Home owners have housing security while renters depend on new housing. Cities that deny housing proposals are denying renters a home in California. CaRLA is a 501(c)3 that holds municipal governments accountable when acting in violation of California State laws. We pursue legal action where developers have not, bringing suit against cities that fail to approve compliant housing. We work for California’s renters, not homeowner wealth. Tomorrow’s housing law workshop: How to babysit your local planning commission! The housing shortage is not an unintended policy outcome. California’s housing shortage is strangling its residents and businesses. Every type of person and business is affected by this crisis. Our shortage results from this unique legal and political culture of California, cultivated over decades of organizing and enacting local policies that have created successive barriers to meeting the housing needs of our growing population. The only way to universally and permanently solve this shortage in the long run is to build more housing. Low income people, who have always had a hard time finding safe and affordable housing, are living in the streets, in their cars, or in overcrowded conditions. At all income levels people are commuting longer than they want to, living in less space than they want to, and are even putting off having families due to these inhospitable living situations. Housing is a human right, but California missed the memo. Homebuilders rely on project approvals for revenue and are unlikely to go on the offensive against malicious jurisdictions. Developers prefer to negotiate with cities rather than pursue relief in court. These negotiations are unnecessary when a housing project is protected by the HAA; yet, many developers do not understand their rights and lack an independent advocate. CaRLA provides free legal aid to these homebuilders. You have rights. We will help you secure them. There is no statewide enforcement agency responsible for housing law. CaRLA pursues legal action where developers have not, bringing suit against cities that fail to approve compliant housing. In doing so, we seek to change the political and legal norm of the Housing Accountability Act and other laws sitting on the books, unenforced. We rely on our statewide network of on-the-ground housing organizers to keep informed of housing law violations. We will build this network through development of workshops, forums, and other educational resources targeted at housing organizers statewide. CaRLA can’t be everywhere at once. We must carefully consider what we focus on. That doesn’t mean that housing law should go unenforced elsewhere in the state. 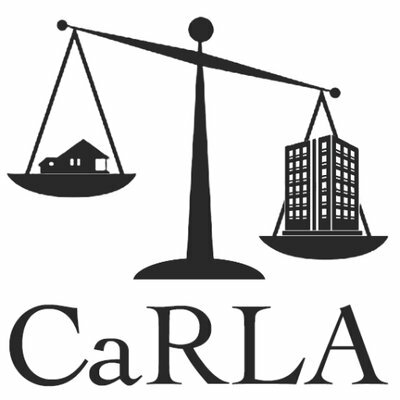 CaRLA is curating a publicly available research library with information on housing law. Our library includes sample court petitions, briefs, legal opinions, and other materials that enable other organizations and individuals to secure their own rights under the HAA and other laws. Housing is a human right and we must use every means available to secure it for all. Even newsletters. The more widespread knowledge about legal protections under California housing law, the less likely those laws will be violated. CaRLA educates the general public on the state of California housing law, including the Housing Accountability Act, through public workshops, panels, and other events. We work with other housing advocates to make it known that homebuilders have rights and CaRLA is here to enforce them. We’re active all over the state of California. Subscribe and you can keep tabs on where we’re at and what we’re doing. We won’t sell your e-mail, honest.